A DUBLIN FIRE Brigade crew member was injured last night when a projectile was launched at him through the window of the ambulance he was in. 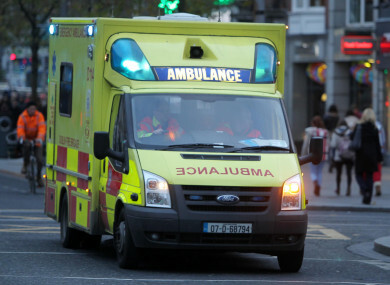 The fire service said this morning that overnight one of its ambulances in the city centre was hit by a slingshot projectile resulting in an injury to a crew member. It is understood the paramedic had just left Townsend Street fire station in an ambulance and that the projectile came in through an open window and hit him in the face. He was taken to hospital for treatment but has since been released. Dublin Fire Brigade said it condemns these kinds of attacks on frontline staff, describing them as “unacceptable”. The fire service wished the injured crew member a speedy recovery. Email “Dublin Fire Brigade paramedic injured by slingshot projectile”. Feedback on “Dublin Fire Brigade paramedic injured by slingshot projectile”.